Will Your Pension Be There When You Retire? The Pension Benefit Guaranty Corporation is a government entity that pays pension benefits if the company cannot. It only covers defined benefit plans. Congress created it with the Employee Retirement Income Security Act of 1974. The PBGC is primarily financed with premiums paid by the companies whose pensions it guarantees. It also makes some money from pension funds it takes over from bankrupt companies. The PBGC guarantees the pension incomes for 44.1 million workers in over 30,000 pension plans. If the companies that offered these plans can't provide them, PBGC steps in. For example, your company could go bankrupt. It could also happen if the pension fund was mismanaged. Other companies did not set aside enough to fund the pension. Millions of retirees would only receive a small percent of what they were due. PBGC also insures multi-employer pension funds. These allow small companies to band together to create diversified pensions. Employees benefit from being able to change companies without losing their pension benefits. There are 10 million current and retired workers in multi-employer plans. Many of them will probably run out of funds. PBGC doesn't cover a plan until it's been trusteed over. The company has terminated the plan and PBGC has agreed to become the trustee. It can only happen if a bankruptcy court determines the company cannot continue to operate if it keeps its pension liability. Sometimes PBGC will decide to take over a plan that's underfunded. A company's plan administrator should provide that information each year to every employee. Once PBGC has become the trustee, the employee cannot earn additional benefits. The PBGC only guarantees basic pension benefits. 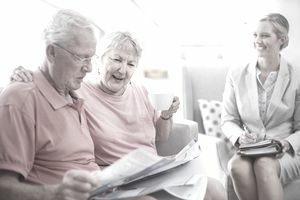 In addition to retirement-age pension benefits, they include early retirement benefits, disability benefits, and annuity benefits for survivors. The benefits depend on your particular plan, legal limits, your age, and plan assets. The PBGC does not guarantee health benefits, severance pay, vacation pay, some life insurance death benefits and other non-pension benefits. There are no cost-of-living adjustments. Many experts believe that an unknown number of companies will not be financially capable of funding their pension plans. If too many companies apply for protection from PBGC, it too will not be able to pay the pensions. This will leave millions of retired workers without an income. Their only source of income will be Social Security. Others will be forced to continue working if they can. In 2006, President Bush signed the Pension Protection Act of 2006, which requires companies to more fully fund their plans. They had seven years to become 100 percent funded. They could take increased tax deductions for the contributions. Plans that weren't at least 80 percent funded could not provide additional benefits. Companies that trusteed their plans to PBGC and then emerged from bankruptcy had to pay a penalty. That was $1,250 per participant for three years. The Pension Protection Act also allowed businesses to automatically enroll employees in their 401(k) plans. Without it, workers were more likely to spend the money instead of saving for retirement. PBGC currently only provides benefits for 683,000 retirees. It couldn't afford to pay for two or three times as many retirees. It could not provide for the 44 million retirees it guarantees. Therefore, PBGC is just a stop-gap measure. It's not set up to address a large-scale pension crisis. Although many pensions are better funded, many more are not. As a result, some are cutting benefits. That's due to a 2014 law that allowed multi-employer funds to cut benefits it they didn't have the funds. The Central States Pension Fund applied to the U.S. Treasury to cut benefits for 250,000 truckers and their families. Treasury denied the cuts. As a result, the Fund says it will go bankrupt in 2025. The PBGC would have to pick up the benefits. But it can't afford to pay full benefits. The PBGC multi-employer fund will run out by 2025, according to its Five Year Report. That's because the premiums paid by employers aren't enough to cover projected payouts. Find out if you have a pension plan, also known as a defined benefit plan. Ask your plan administrator for a copy of the Summary Plan Description. That will tell you if you are covered by PBGC. Also ask if the pension is at least 80 percent funded. Most new workers today don't have one, because their companies now offer 401(k)s instead. What Is Considered Middle Class, and Is Your Household Part of It?